emily lam | blog: After The Initial Excitement! "iPhone!!!! Omg!!!! The retina screen on this phone is amazing. It's so slim. It's just beautiful. I can play games. Look at that, it's a GPS. Wow, what can I not do with this phone!!!" The above is basically what I've been thinking when I look at the below. 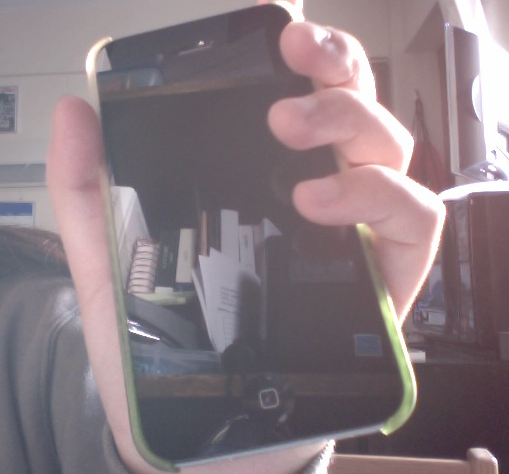 Haha, you can see a reflection of my stuff on the iPhone. But, a month has passed since I have become an iPhone user, and I have, I think, finally gotten over the bells and whistle of the iPhone. And after the initial excitement of owning an iPhone . . . I am finding the iPhone to be a very powerful and amazing device. First of, I want to say that I had a simple phone before the iPhone. You know, one of those phone that had all these random very basic functions, alarm, camera, an mp3, some form of calendar, task, tools, tip calculator, etc. But yet, all I did on it was text and call. The iPhone is my first smartphone. Just thought I throw all this out there before you laugh at my newbieness. Anyway, the best part, I believe, of the iPhone is its ease of use and compatibility with my mac – I know, it would be a lamer if it was not compatible with my mac. It's an apple product after all. Everything syncs! And because everything syncs, my life is digitalizing. For example, now, more than ever, I don't use my agenda. All my events (birthdays, activities, exams, etc.) are put into my calendar on my mac, which is then syncs onto my iPhone. I no longer have to carry around my agenda, although I still do. It's just chilling in my backpack. I don't even know why I always buy one in the first place when I clearly don't write half of my assignments in it. However, there was one time last semester, during finals week, that I planned my entire life out in my agenda. But that was just one week. So basically, I can do one thing on my mac or iPhone and it syncs to the other. Awesome! But yeah, having the internet, camera, phone, notepad, clock, mp3, calendar, etc in the palm of your hand is pretty amazing. 2. iPod – One of the main reasons I wanted an iPhone was so that I would not have to carry both an iPod and cell phone. The other main reason was to not carry a camera. I have not really used the camera app yet. But it might be because I haven't run into anything I feel the urge to photograph. 3. Messages – Texting is just something our society does. 4. Safari - The ability to surf the interwebs anywhere I am. Enough said. 5. Calendar – Surprising, I have been using this app. I never made use of the calendar application on my mac but now that everything syncs, it's so convenient to have all my events on my phone and mac. Maybe now, I can time manage effectively. LoL, that's funny, me time manage effectively. Haha. 6. Notes – Slowly, I feel this is taking the place of physical sticky notes. Right now, I mainly use this app to write down reference material, like office hours. My to do list is still on a physical sticky note. Physically crossing something off my to do list is way more satisfying than hitting the delete button. 7. Facebook – The black stain and guilty pleasure of our society. But it does help you stay connected with your friends. It's a Win/Lose kind of thing. 8. Clock – Time, Alarms, Timer. The ability to sleep my iPhone in an hour when I forget to turn off iPod because I fell asleep. 9. Maps – I like that it has a GPS worked into it. So when I'm walking somewhere I don't get lost nor have to look up directions before hand. I'm so LAZY. 10. Phone – I use this mainly to communicate with family and when I'm too lazy to text. Talking is still easier than typing. Wow, I really am lazy.